So you’ve registered a new contact; they’ve shown an interest in your product or service, and perhaps they’ve explored a few of your website pages. As a great salesperson, you’ve taken this as your cue to investigate them more – explored their own website, perhaps looked at their LinkedIn profile, and generally acquaint yourself with the person – ahead of reaching out to them via email. 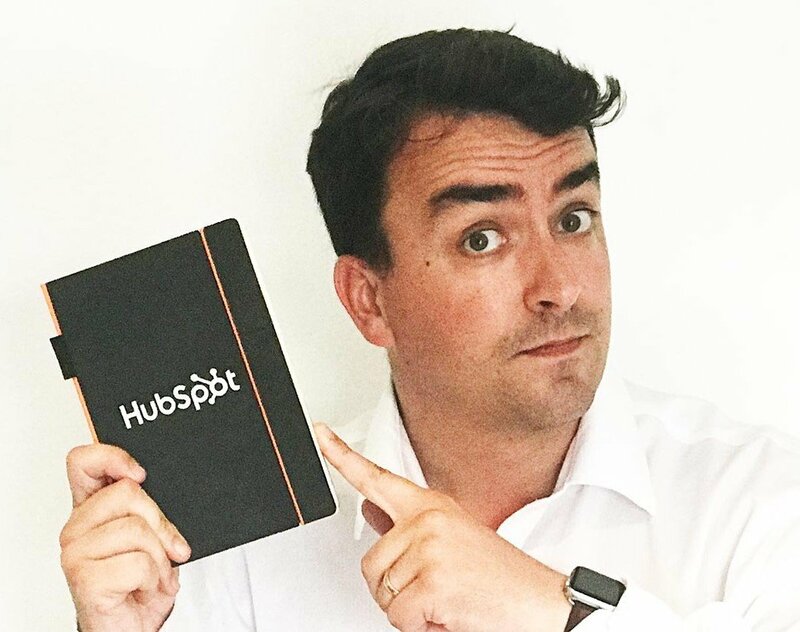 You’ve probably spent some time crafting a personalised email, introducing yourself, noting their interest in your site, then offering to help them further (perhaps you even included a short prospecting video at this point?). Once that email’s been sent though, it’s disappeared into the ether and you might never hear from that prospect again. Maybe they won’t even open your email before consigning it to their deleted box. So it’s time to give up and move on, right? Wrong! This is where you send the all-important follow-up email. Get this bit right and you’ll attract your prospect back to you, not only opening your email, but far increasing the likelihood of them sending a response. As the popular expression goes – ‘insanity is doing the same thing over and over again and expecting a different result’. If your prospect hasn’t opened, replied to or acted upon your initial reach out to them, sending a very similar email as your follow up isn’t likely to inspire a response either. One of the biggest mistakes we marketers make in our initial outreaches, is that we don’t make our emails personal enough. Customers are so email savvy now, that they can spot a template or copy/paste job at a hundred paces. If you think you may have fallen victim to mass-emailing methods, even when you’re trying to personalise, it could be that your follow-up email is the opportunity to create something truly bespoke, and show a prospect you really are keen to treat them as an individual. After extensive experimentation, Sherer realised that merely changing the prospect’s name, then copying and pasting the main bulk of the email, before putting the onerous on them to arrange a time for a call, wasn’t personal enough. Tailored, focused and valuable means a lot more than switching names or twiddling with calendar dates, forcing recipients to squeeze in around your timetable. In our example above, the main personalised element is the video. But what if the prospect doesn’t get as far as watching the video? The rest of the content is a bit flat; a personality-free message which could be sent to anyone. Instead, you need to add real tailoring, focus and value to your follow-up by doing a few extra little things. In this version, you’ll notice far more personalisation. It’s slightly longer, and took slightly more time to write, but if your open and reply rate increases, surely it’s worth taking these extra measures? The subject line: ‘just’ is a small word that can make a lot of difference. 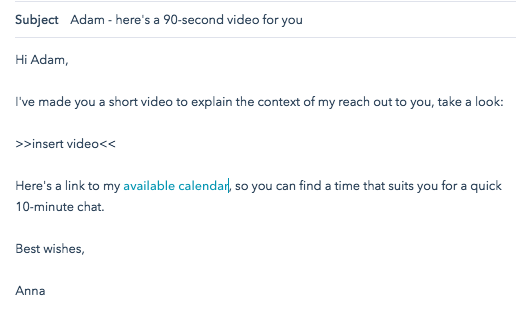 By using their first name and stipulating this video is ‘just’ for the recipient, you’re telling them this isn’t a blanket email – there’s personalised content within if they choose to click. I open with an example of something I’ve recently read or seen by the recipient – this takes a little research but is an easy way to show you’re paying attention and care about them. I’ve further shown I actually listened/read their recent writing/presentation they did by highlighting something specific that I found interesting – commenting that you’ve now subscribed to their blog, or signed up to a webinar they’re running, shows a commitment to working together from your side. Asking what they thought of your previous video, while also including a link for them to watch it if they didn’t already, means you’re showing their opinion counts. If they forgot about the video, it's a gentle reminder and easier than them having to search back through their email for it. 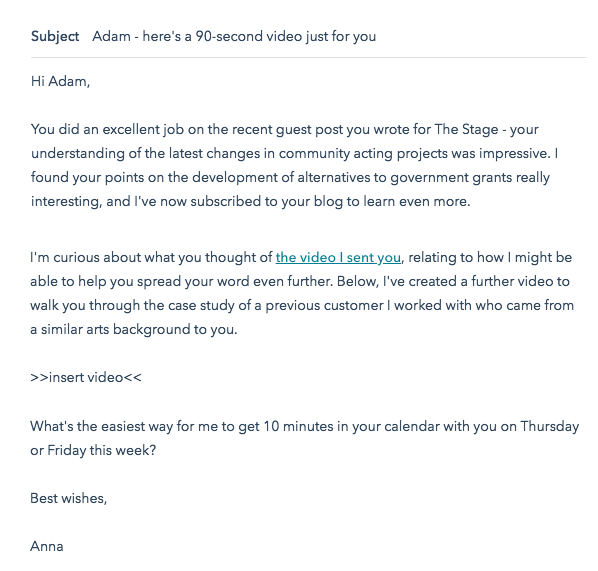 Linking to another personalised video within this follow-up email shows you really aren’t giving up! It makes it much harder to ignore, too: not responding to video number 1 could be an accident, but ignoring two personalised videos may come across as rude, which most people want to avoid. A second video also offers them further value – access to a case study or another resource that you didn’t show the first time around makes you more appealing and trusting: you’re giving helpful tips away for free and being benefits driven, not talking about the features of your product, but how you want to help them solve their pain points. Finally, instead of inserting a link to your calendar and telling them to work around you, position this section as a question. Ask when would be a suitable time for them, and make it clear that you’ll do all the work: you’ll call them to suit their diary. 'The purpose of a first-touch prospecting email is to make the reader interested to know more. It's not supposed to be a substitute for a website or a presentation (which won't even be effective until later in the sales process when you can customize it to your buyer's specific needs). Remember, if your initial prospecting outreach doesn't work, your follow-up is even more important – this might be the last chance you get to engage this prospect without them feeling like you're spamming them. No-one gets 100% response rate, but by adopting the habits in this post, you'll give yourself a really great chance of grabbing the attention of previously disengaged prospects, proving that a follow-up email is always worth crafting with care and attention.